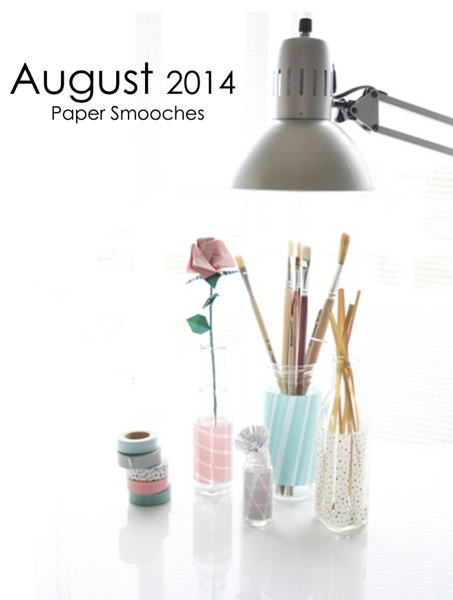 Where did August go? Here's me thinking I had plenty of time to play along with Tim's 12 Tags of 2014, when all of a sudden, September is staring me in the face. This month, we are free to follow our own muse. I wanted to use a combination of colours that (a) I hadn't combined before and (b) appealed to me (always helps! ), along with a few of my favourite Tim Techniques. I sponged Wild Honey, Worn Lipstick, Stormy Sky and Evergreen Bough on my tag, then flicked water onto the tag, and water-bleached more colour off with the text stamp. Then I overstamped with the diamond pattern in Versafine Smoky Grey and stamped the dragonfly with Versafine Onyx Black. 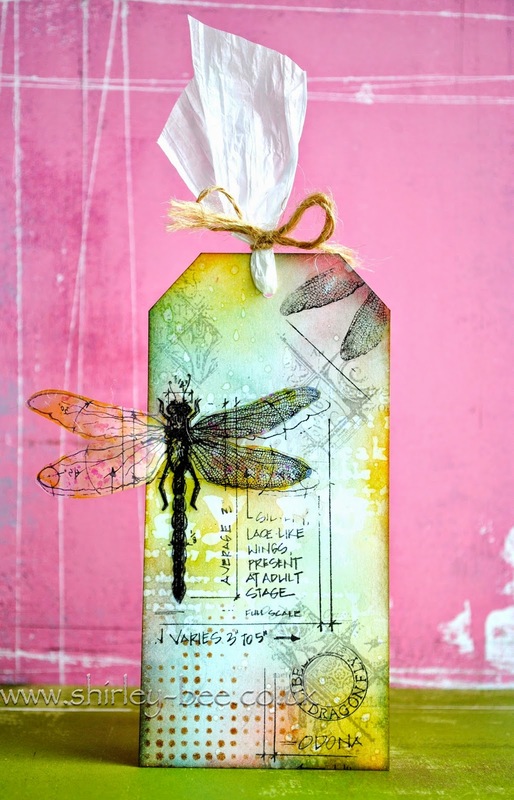 I stamped a second dragonfly on to acetate with black Staz On, then coloured the reverse with alcohol inks, trimmed it and stuck the body over the partially stamped image on the tag. I've folded the wings up but it's not easy to tell from the photo. I sponged some Vintage photo around the edge of the tag and added some white raffia and string. Oh, and some Crackle Distress to the other wings in the top right corner. And some stencilling in the bottom left corner. I've been having a Winnie & Walter Fest over the last couple of days. 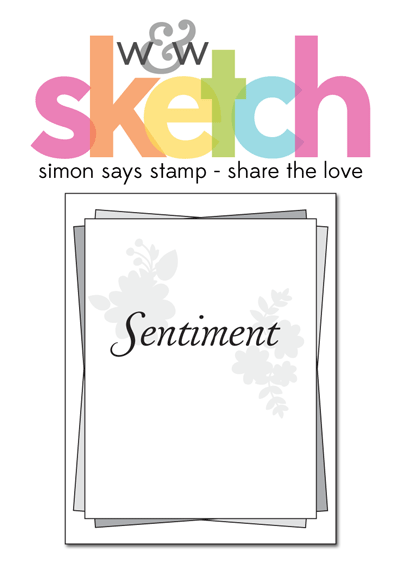 All this week Winnie & Walter have been sharing the love with Simon Says Stamp, with a different challenge every day. Just one problem, I keep merging the challenges! This first card was using the colours for Playdate No. 3, but I made it in 6 minutes 18 seconds so it qualifies for the Day 2 challenge - 10 Minute Dash. And I think it also qualifies for Day 3 - Focus on 1 Stamp. I've used the leaf mask from Simon Says and the sentiment from The Big, The Bold and The Happy. This second card is also for the Day 2 - 10 Minute Dash, and Day 4 - One Layer Card. This one took 5 minutes 22 seconds. I saw a recent video by Shari Caroll of Simon Says Stamp where she resurrected a Tim Holtz technique. I didn't use compressed air, I just splatted Distress Stains. 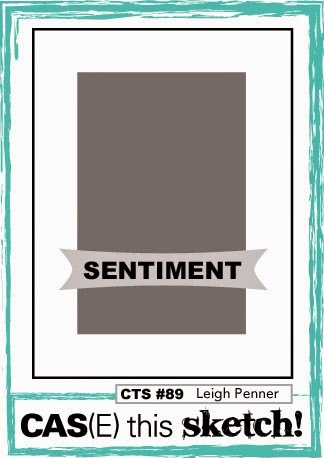 The sentiment is from The Big, The Bold and You, and the other stamps are from Simon Says Stamp, but I'm not sure what the sets are called (unlabelled blog candy). This next one was going to be a one layer card, and I'm so glad I didn't set the stopwatch for it, it took forever! The idea had been to cut the Merry Christmas sentiment, adhere it temporarily, wash colour over then reveal a white sentiment. Unfortunately the inks soaked straight through the paper die cut I'd used. So I cut another sentiment in white card and adhered it in place. 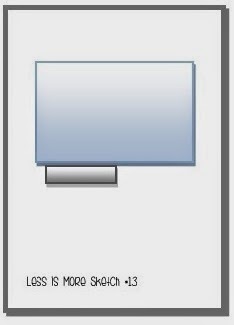 So it's no longer a one layer card. 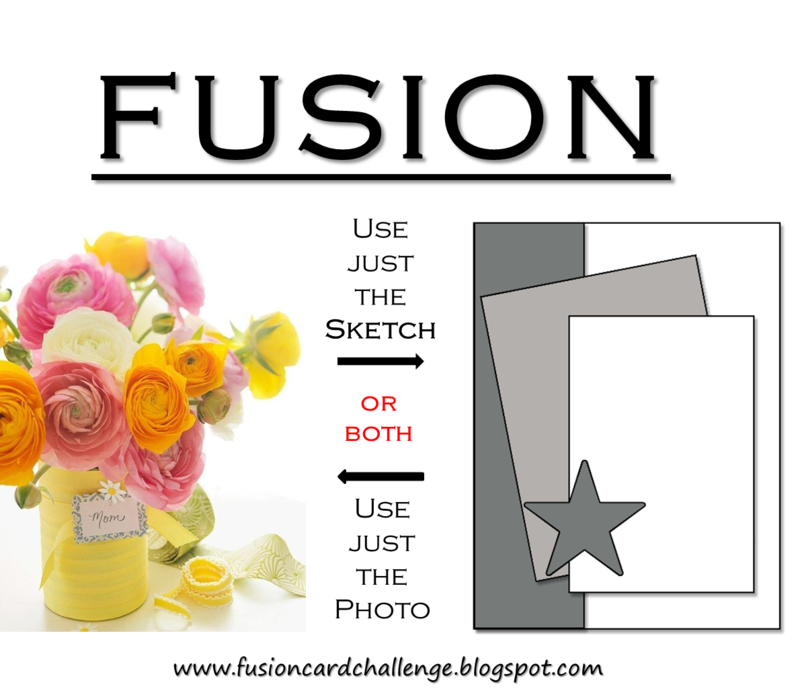 But it does qualify for Day 3, focus on one stamp (Scenery: It's a Wonderful Pennant) and use one Simon Says Stamp product - die cut sentiment. I laid the leaf cluster mask on my card panel, sprinkled it with Brusho powders (new toy) and spritzed, then removed the mask (and laid it on another piece of card). Look at that fabulous detail, I love it! I never did Day 1 - Rainbow. I could be back! A quick card, followed by a long post! I'm entering this into Simon Says Wednesday Challenge, Anything Goes, and Simon Says Stamp Work It Wednesday. The image is my own design, and the sentiment is from Winnie & Walter. Last week I was tagged by my supremely talented teamie, Vicki Dutcher, to take part in the Blog Hop with a Difference, where you answer a few questions about yourself, then nominate others to do the same. Depends on the type of project. 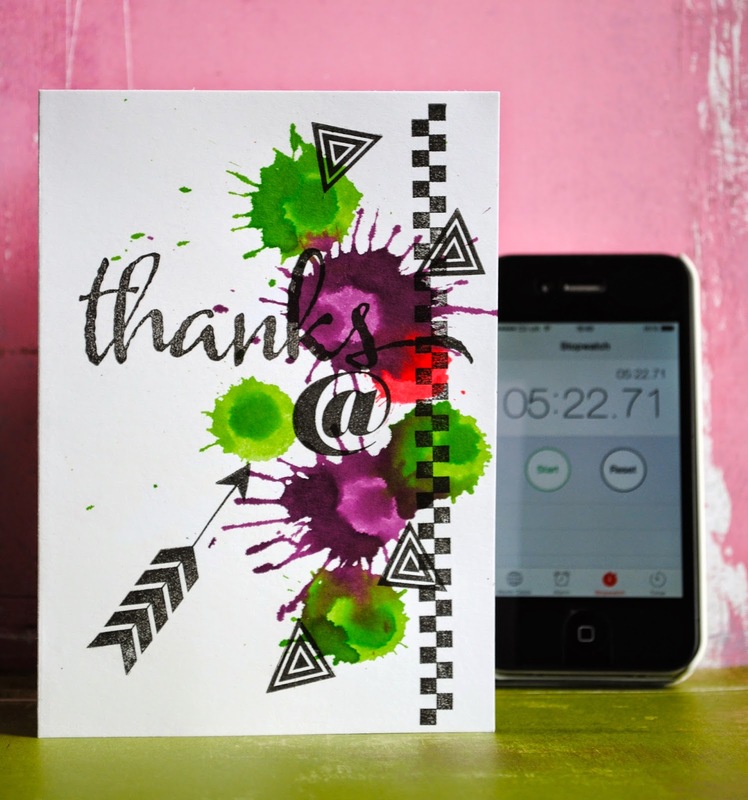 If I'm making a card using Distress Inks, it's usually pretty quick, around 15 minutes or less. Check back tomorrow and you'll see two that I did in less than 10 minutes each. If it's a mixed media card it takes longer because there are more elements and more drying time. And if it's a design team assignment that's outside my comfort zone - could be hours! My other newest fad is Brushos. One of the paintings I'm submitting to the village show uses Brushos. I'll post a photo of it after the show. 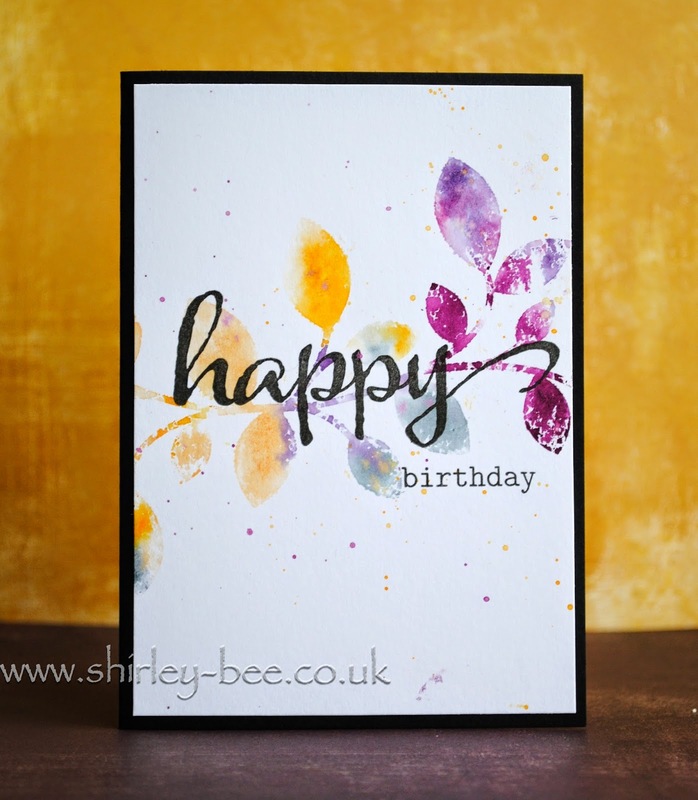 I'm on design teams for STAMPlorations (including fortnightly feature posts), Craft Stamper Take It Make It, Seize The Birthday and The Mixed Media Card Challenge, so there's always a project to make for these, but I also enjoy playing along with, and combining, challenges. I like to combine two or three challenges with one card so that often determines the theme, colours and sometimes the sketch that I'll be using. I used to have issues with sketches but I'm learning to live with them, especially if they're CAS. Having sorted all that out, I've usually got a picture in my head of what the main image/focus of the card will be, but it does evolve. 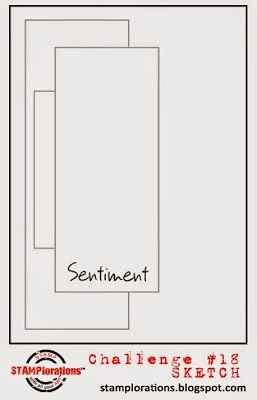 Quite often I'll start a card then go off at a tangent and make two or three different ones, changing my mind as I go. I very rarely have a practice run, I just go with the flow. Probably because I don't can't do precise, so there are less "mistakes" - I can get away with incorporating mistakes into the design. And if it's not working straight away I abandon it and try something else. 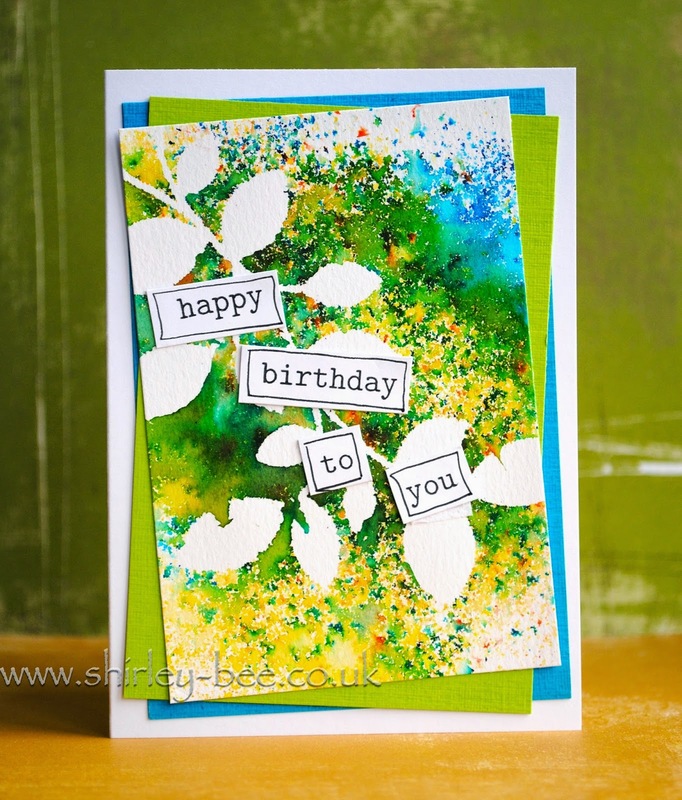 Challenges are a huge inspiration: colour combinations I wouldn't have thought of, different ways of using stamps or other products. And the interpretations of those challenges by design teams and participants are also a big inspiration. I do pin things on Pinterest, but don't often think to refer back to it. Sloshing and splattering! With a sprinkle of artsy? I'm allergic to cheese and I hate shellfish. Which drives my chef DH mad because it limits his repertoire. Shery Russ of One Layer Cards and owner of STAMPlorations. I first started stalking following Shery after seeing this card. Then she made me buy some poinsettia embossing folders after I saw this card. 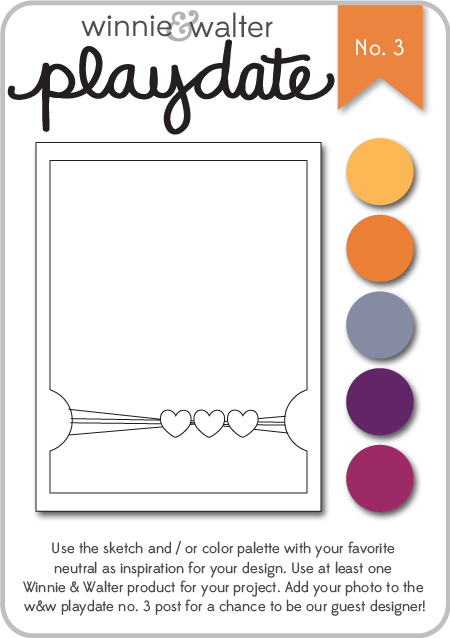 I was thrilled to be accepted onto the design team for STAMPlorations (I get to play with her stamps, yay! 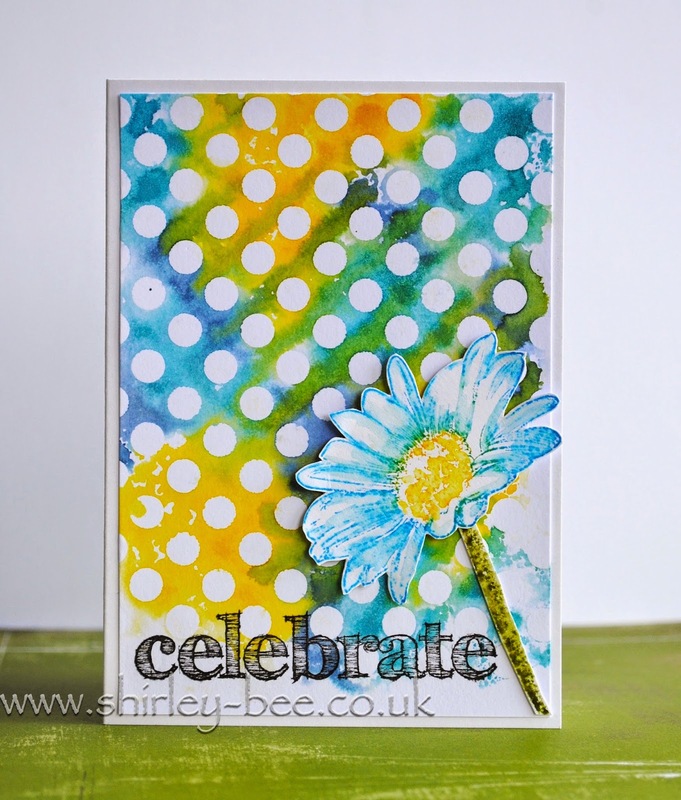 ), and also onto Shery's latest challenge blog, The Mixed Media Card Challenge. Shery makes the most wonderful detailed one layer cards. Jenny Martin of My Paper Epiphany. 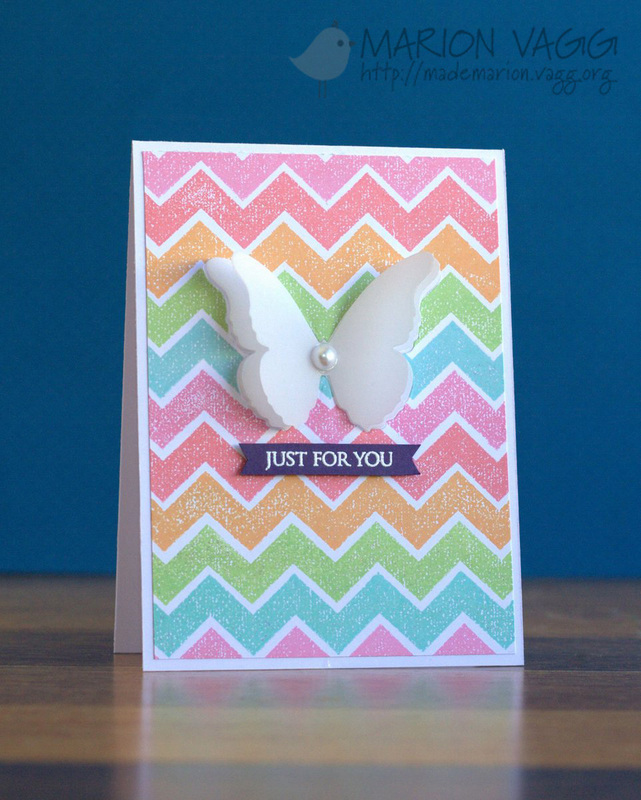 I love what Jenny creates with butterfly stamps. Look at this card, and this one. And this one's got splatters, yay! And look at how she uses colour here, and with these birds here. I had the pleasure of meeting up with Jenny when DH and I were in Australia last year visiting our sons. It's time for another challenge at Seize The Birthday, and this week it's black and white. The 'Oh Snap!' sentiment just screams out for a belated birthday card, so I used an Eiffel Tower image from Paper Artsy along with the film strip image and sentiment from Bo Bunny. I wrote the rest of the sentiment. So what will you do with black and white? 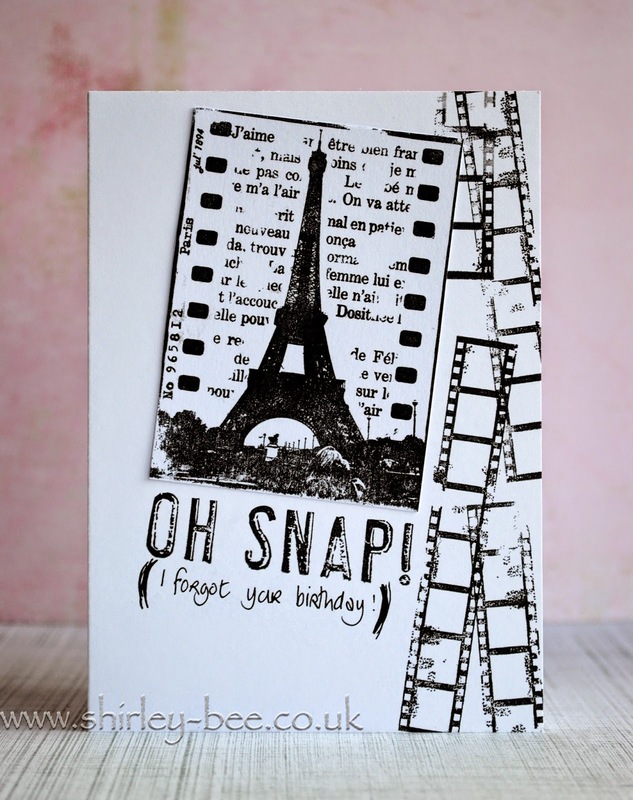 Pop on over to the Seize The Birthday blog for more fabulous inspiration from the design team. If black and white doesn't inspire you, you can still play along with any birthday project. and Simon Says Stamp Work It Wednesday. I'm playing along with the sketch at this week's Less Is More, although I've stretched the sketch a little bit. I used my bargain-fell-into-the-supermarket-trolley-Sharpies to colour the bells and Distress Inks for the background. Looks like I'll have all my Christmas cards done in record time this year! I've finally broken open my Winnie & Walter V for cheVron set to play along with a few challenges. 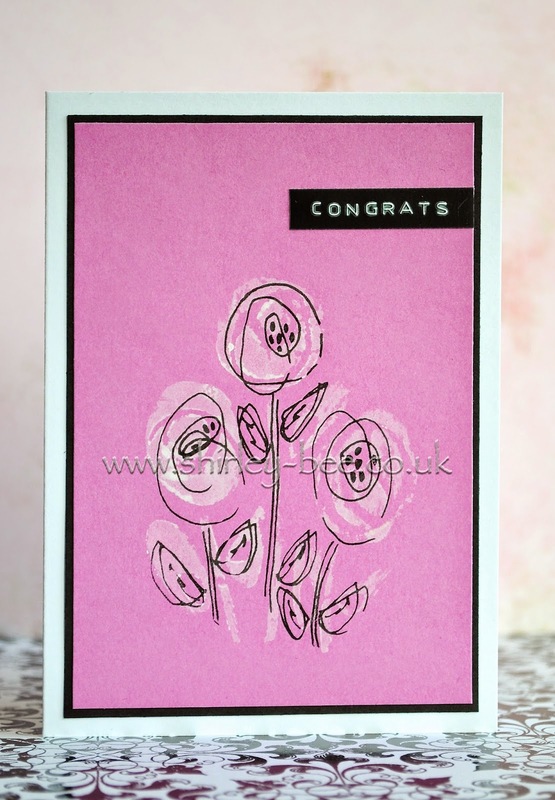 The first one is Time Out, where the challenge is to case this lovely card by the even lovelier Anita, with a twist. A stretch too far, do you think? I'm also joining in with Simon Says Monday Challenge - Anything Goes. And Winnie & Walter Join In To Win. It's party time! Today we're celebrating the birthday of my lovely STAMPlorations teamie, Nonni from Korttikarkuri - Runaway Cards. Sandie from London Days is kindly hosting the linky party. Nonni is a fabulous cardmaker and expert colour-in-er ... colourer-in ... she's great with Copics! I don't own Copics, although I did bag a set of 24 Sharpies for half price in the supermarket yesterday - and they don't count as a spend because they fell into my trolley when I was grocery shopping :) They're still in the packet, so today I used my trusty Distress Inks to do a stencil print background, and inked the flower in Distress Ink then pulled the colour with a water brush. 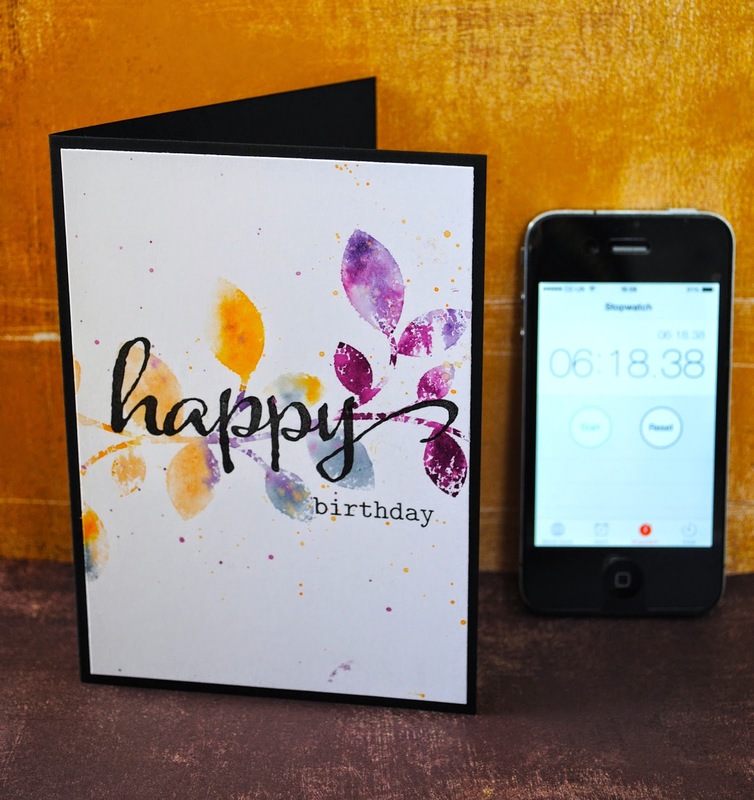 The stem is made from a brushstroke stamp. All stamps are STAMPlorations. You need to click on over to STAMPlorations. For one, you can see Nonni's oh-so cute puppy, Rafa, making a guest appearance, and also the Design Team's pet gallery. 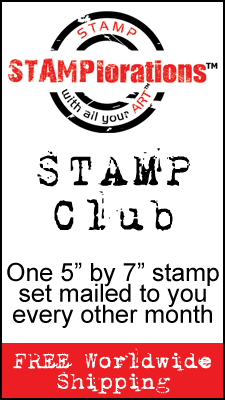 And for another, you can't miss the fabulous offers Shery's got on at the moment with the pre-release and the stamp club. 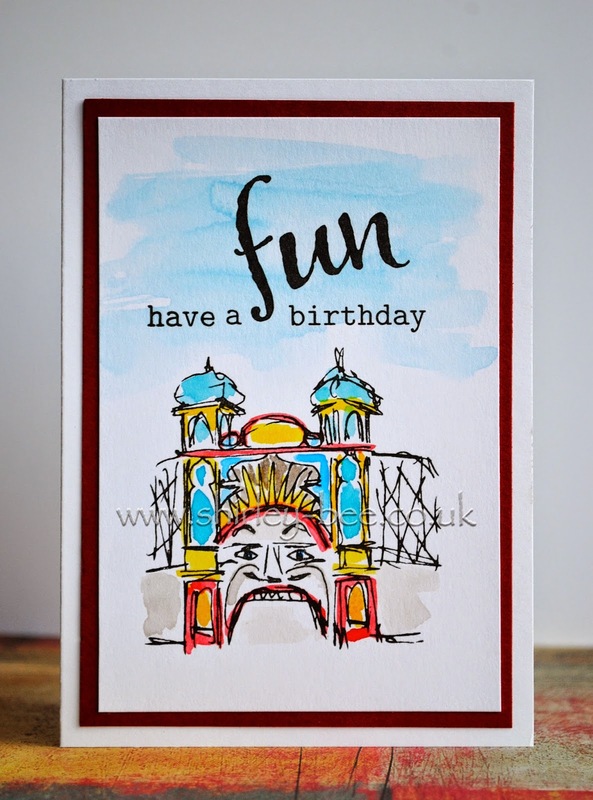 I'm entering this card into Simon Says Monday Challenge - Anything Goes and CAS(E) This Sketch. I've been playing with new toys. 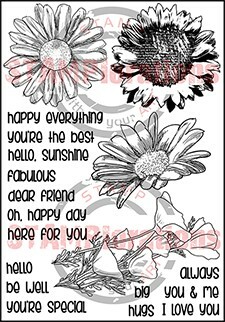 I saw this card on Pixie's Crafty Workshop and immediately had to have some Brushos. As it was DH's birthday weekend when I was ordering them, I chose second-class postage (free) because I knew I would't have time to play with them for a few days. I ordered them at 6pm and they turned up the next morning - great service, Amazon! But I was very good and left them alone for a couple of days. 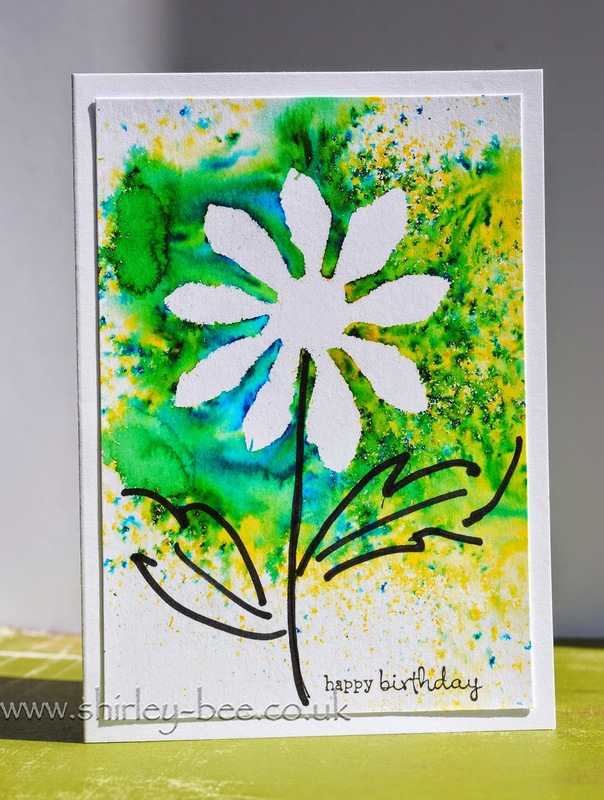 For this panel, I die cut a Tim Holtz tattered flower from watercolour paper and stuck it down temporarily, sprinkled lemon, leaf green and aquamarine powders, then spritzed, and removed the die cut. Wheee!! I drew in a stalk and leaves and stamped the sentiment. You can make a wash by mixing the powders with water, but I'm still playing with the exploding properties yet. 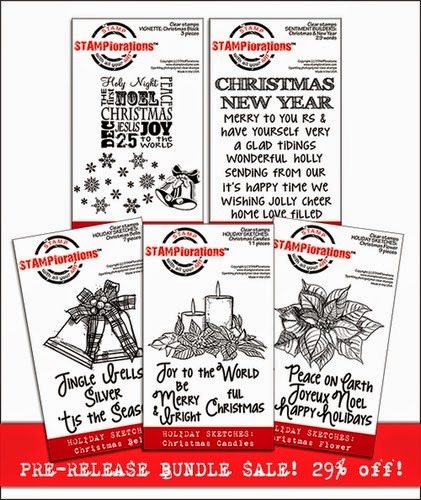 Don't forget, Craft Stamper Take It Make It Challenge is still open - you can choose any technique from any issue this year so far. Also, I'm over at STAMPlorations tonight with a feature on generational stamping. See you there! It's time for a new sketch at STAMPlorations, and I've been playing with my new toys stamps :) First, the sketch: look at that, hardly changed anything! Just moved the sentiment. And here are the new toys, Bloom Sketches. They're available now at a pre-release discount, and they are also the first release in the newly-launched STAMPlorations Stamp Club. 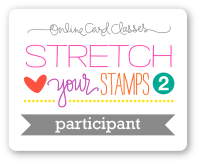 Check out the link for all the fabulous money-saving details. 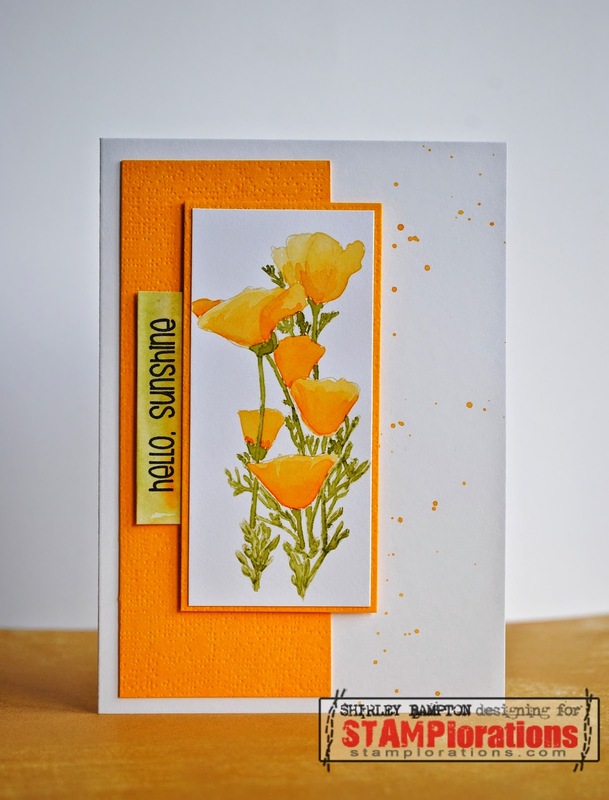 Our guest designer is Carol from Just Me: c. Pop on over to the STAMPlorations blog to see what Carol and the rest of the DT have created for your inspiration. I'm entering my card into Simon Says Wednesday Challenge, Summer. 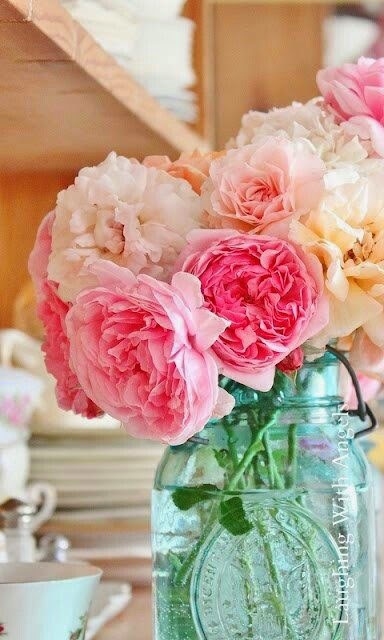 What speaks more of summer than gorgeous vibrant flowers? 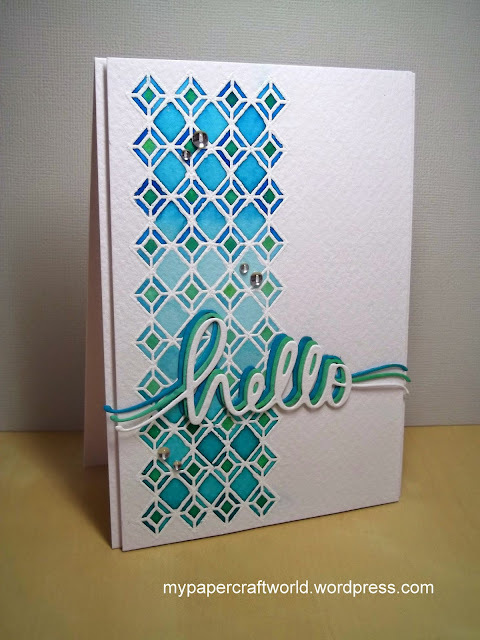 I used the same technique that Dawn demonstrated in Stretch Your Stamps 2. For me, that is the best example of stretching your stamps and I love the technique. 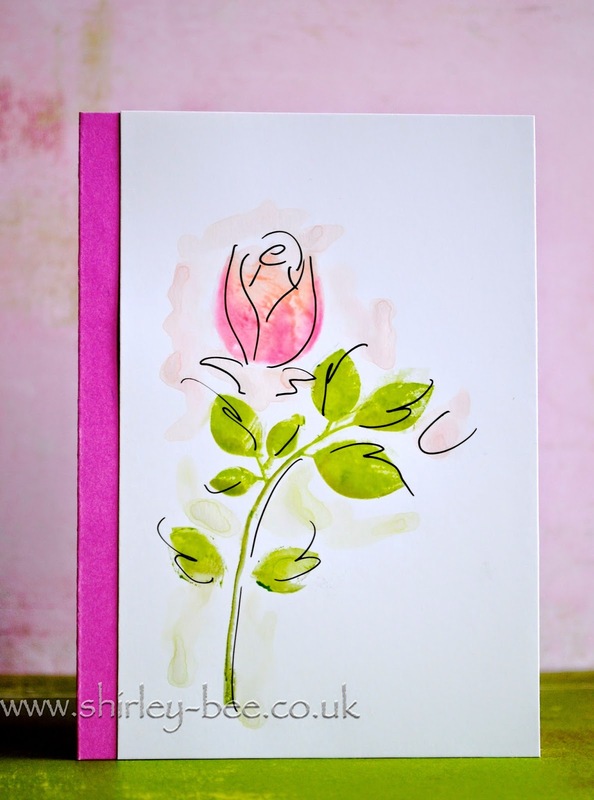 My rosebud has a split personality because it's actually the tulip stamp from the Bold Blooms set! Just shows what a bit of squidging and scribbling can do. The leaves are from Reflections and the stem is from Bold Blooms. I used a 0.5 pen to scribble.